that grows through scholarship, practice, reflection, and collaboration. Founded in 1989 as a faculty initiative, the Center for Teaching Excellence promotes excellence in teaching by getting to know our faculty and graduate students, learning from them, fostering leadership, and bringing people together from across the University. We provide consultations, workshops, and print and web resources on teaching and academic success. We focus on implementing evidence-based, high-impact educational practices with the Duquesne community of teachers and learners. Implement sound instructional strategies focused on student learning by embracing evidence-based pedagogical ideas and a spirit of innovation. Create well-designed courses and curriculum that incorporate strong learning-assessment strategies resulting in deep learning. 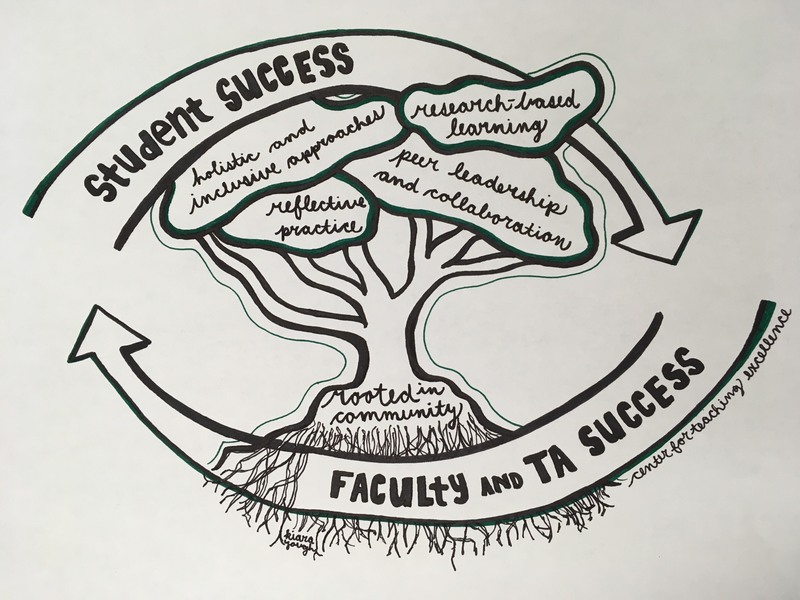 Succeed as teacher-scholars engaged in pedagogical development and academic research in whatever stage they are in (tenure-track, tenured, non-tenure track, adjunct, teaching assistants). Approach personhood holistically with a view to understanding their students and themselves as people balancing personal and academic demands. Feel like they belong and contribute to a community that values teaching excellence, collaboration and diversity. What impact has the Center for Teaching Excellence had on faculty teaching and career success? Read the results of our 2017 Impact Study, from which the drawing below emerged. excel as teacher-scholars deeply invested in their students' learning.